Rope Access provides safe and rapid access to difficult-to-reach locations for testing, inspection and structural engineering functions without the use of cradles, scaffolding, or an aerial work platform. Progressing from techniques used in caving and rock climbing, the rope access industry has compiled an ideal safety record over the past thirty plus years while recording millions of man-hours. Rope access is known to be a safer alternative to conventional access methods, minimizing the amount of man power and the requirement for equipment on various projects without compromising on high degree of safety. The method of rope access is commonly implemented to carry out the inspection of columns, piping, vessels, and other structures. 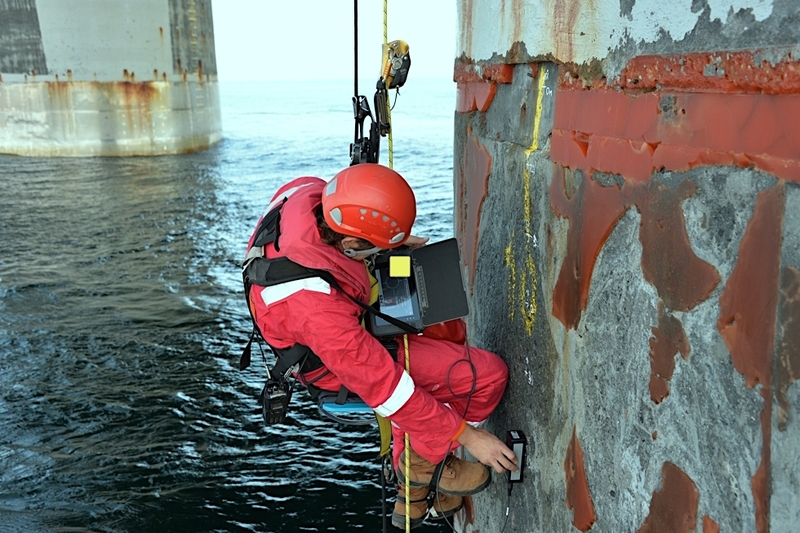 Rope Access technicians commonly perform inspections using various nondestructive testing (NDT) methods. A team of rope access technicians has the capability to unite various crafts, enhancing the ability of the work being performed. This could be as easy as executing insulation work adding to an ultrasonic thickness inspection. In such a scenario, the team of rope access technicians can cut inspection windows, perform the inspection required, and close the inspection windows all at the same time. This type of proficiency could allow for a unit inspector to handle one team member who finishes the required work instead of coordinating with a scaffolding member, inspection member, and insulation member; allowing time for other responsibilities. Rope access enables performing a greater degree of inspection. Inspections are no longer restricted to accessible areas near ladders and platforms, nor are they limited by the costs associated with erecting a scaffold, thanks to the additional accessibility rope access provides. Any part of the piping system or vessel is now accessible for inspection. Moreover, while rope access team is working at height, areas that are not typically within view can be seen on the equipment, making it easy to work. Also, the team can spot irregularities that exist on other equipment in close proximity. Usually, these places are difficult to reach even during turnarounds and so they are typically not maintained. When advanced NDT services are added, Inspection becomes even more powerful. Executing an AUT scan on the back side of a vessel or on remote piping can collect enormous amount of information. 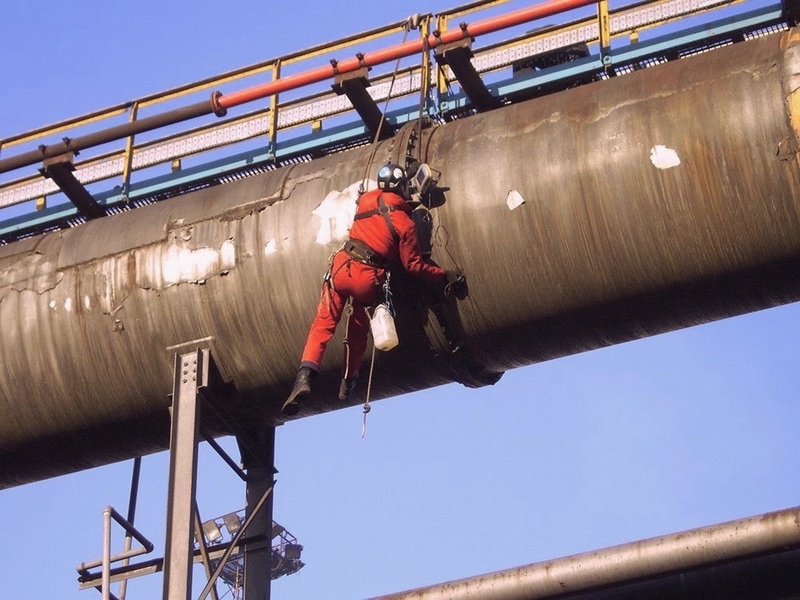 Technologies like Phased array UT on an elevated weld seam, eddy current scanning for surface cracking and tube inspections and guided wave UT to find welds and corrosion on long runs of pipe have been proven on their own merit, and rope access can make them more available and successful. Rope access is not just limited to inspection. Tasks like welding, painting, insulation, electrical, mechanical work and cleaning can all be completed utilizing rope access. Using this technique, technicians have installed spring hangers, hung piping, insulated piping and vessels, and performed a lot of other tasks. Even if some say, scaffolding is cheaper, time saving is more valuable. Plants can take advantage of short time windows for completing projects, since work can be completed quickly. In conjunction with conventional equipment and methods, rope access can also be used. Technicians tend to be good riggers; that certainly makes them more helpful on heavy lifts like flare tip changes with a crane. They can also make use of air tuggers. Very heavy equipment can be moved easily with the capability to set pulleys and re-direct quickly. Rope access technicians can also set staging for non-climbing workers. This technique has its own limitations as not every job is a best suited for rope access application. Rope access technicians are highly trained so their fees is typically higher than the comparable craft on the ground. Also, projects where a very large number of workers are needed, rope access is not be something that people prefer. Another limitation is around hot equipment. If the area is too hot, just like in case of heat exchanger fans, it might be at high-risk for rope access technicians to work. Rope access is a valuable tool that enables operators to enhance the inspection and maintenance efforts. When used properly, rope access saves money and time, and makes facilities safer.